Canned tuna is one of the best proteins out there — it’s super nutritious, and requires absolutely no effort, just open the can and eat. That being said – quality is important. If possible, we advocate for choosing brands that are sustainably sourced. Choosing a brand that says the tuna has been caught by pole and line is something I try to do. This means that the fish were caught one by one – not by using a big net that scoops up a bunch of other marine life at the same time. I like the brand Wild Planet, Ocean Naturals, and the Whole Foods brand. 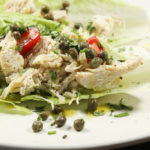 These easy lettuce wraps require pretty much that same amount of effort as opening a can of tuna, but they are loaded with flavor, thanks in part to caper berries, tiny round berries that are pickled to be salty and briny. Perfect with tuna. 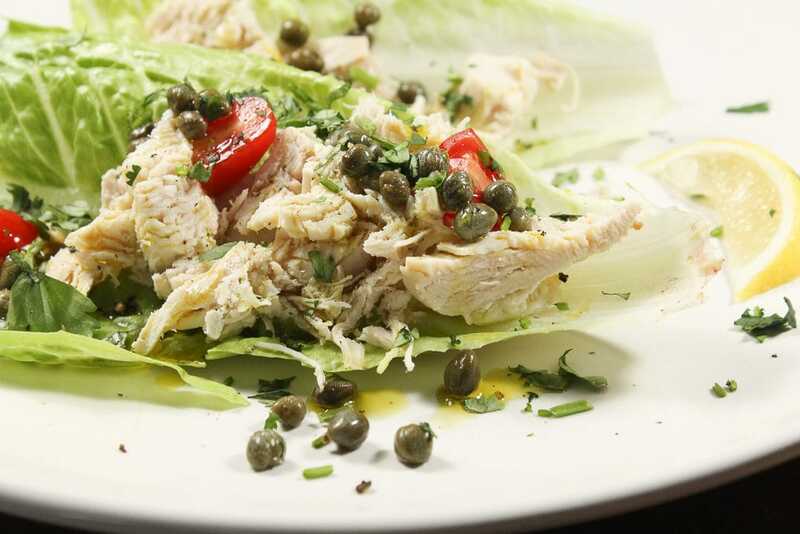 Combine the tuna, oil, lemon , capers, parsley and garlic in a bowl. Season with salt and pepper. Spoon into the lettuce leaves and top with the tomatoes before serving.